When 'Positive Confession' first arrived in this country, it transformed some dead churches and struggling Christians. Many who had fought against the odds to survive as Christians found a new life of victory; the idea that believers were doomed to be the victims of circumstance and helpless in the face of satanic attack was challenged. This was good and useful, and served to increase our faith in the truths of scripture. Now, the whole content, goal and product of the various Word-of-Faith ministries has to be questioned. Although there seems to be fruit, in the form of healings and new converts, we have to ask how genuine these are and how sound is the foundational teaching such new converts will receive? We also have to question the need for Ministers to live in great luxury, demanding millions of pounds for an ever-increasing number of projects, some of which never materialise. The ultimate goal of such ministries also needs to be examined in the light of scripture. Are we witnessing a global awakening that will transform all nations and bring wealth and success to all the Church? Or is this triumphalism a delusion which will ensnare thousands of well-meaning believers in the satanic trap of the New Age, and cause them - unthinkingly - to set up a worldwide kingdom for the Antichrist? READ ON for ten reasons for rejecting Word-of-Faith doctrine. 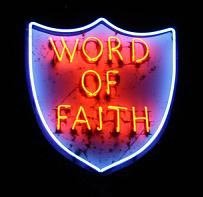 Word-of Faith teaches Christians to draw upon powerful 'forces' that reside in the human spirit - such as the force of faith - to bring certain laws into operation. They emphasise the word (not the Son of God, but the scriptures) as the power used to operate all these spiritual laws. So, learning and confessing the Word continually is the method used to obtain anything we want. This self-rule leads to pride and greed. But a Christian must deny himself and submit to the entire will of God, as revealed moment-by-moment by the Holy Spirit. Some of the Word-of-Faith teachers and ministries have been the worst offenders in bringing the Name and the cause of Jesus Christ into disrepute. Ministries that emphasise prosperity have ended up in greed, manipulating believers into giving money they can little afford. Over-emphasised teaching about God's healing has led to extravagant claims for miracles that have been exposed as hyperbole and sham. Doctrines about man's godhood and superhuman abilities have led to arrogance, self-will and the use of psychic powers to perform miracles instead of a simple dependency on the Holy Spirit. Also, teachings about faith have become rituals and formulas for producing instant result; and many who could not or would not go down this road were derided and rejected as "having no faith". What we can learn from the Word-of-Faith doctrines is really no more than straight-forward biblical teaching in the first place - faith in God and in His Word, belief in divine intervention in our affairs, a positive outlook based on the promises of God, and a knowledge of the defeat of satanic powers in Jesus - all this and more is good and sound, but the Word-of-Faith movement today has gone far beyond these boundaries and created a monster that is devouring both its leaders and followers alike.